Credits: NASA/JPL-Caltech/MSSS and Dr Paolo C. Fienga/LXTT/IPF for the additional process and color. The NASA - Mars Curiosity Rover and Laboratory recorded this view of the Sun setting at the close (---> end) of the 956th Martian Day, or Sol (such as April 15, 2015, on Earth) of the Mission, from the Rover's location in Gale Crater. 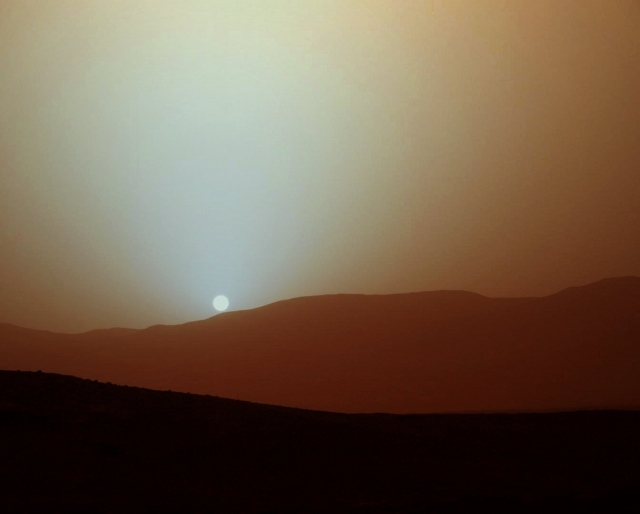 This was the first Sunset ever observed (---> shown) in Absolute Natural Colors by the NASA - Mars Curiosity Rover and Laboratory. The image comes from the Left (Sx)-Eye Camera of the Rover's Master Camera (or "MastCam", for short). The colors have been calibrated in order to remove some - possible - Camera Image Artifacts. The MastCam sees color very similarly to what human eyes see, although it is actually a little less sensitive to blue than people are. The Dust present in the Martian Atmosphere has (also/among other things) fine (Water-Ice) Particles that permit the Blue Light to penetrate the Atmosphere itself more efficiently than the so-called "longer-WaveLength" Light/s. That situation causes the blue colors existing in the mixed Light coming from the Sun, to stay closer to the Sun's upper part of the Sky, when (and if) compared to the wider scattering of yellow and red colors. The visual effect is - as we know now - most pronounced near the Sunset, such as when the Light from the Sun passes through a longer path in the Atmosphere of Mars than it does during the Daytime Hours. This picture (which is an Original White-Balanced Color Image obtained by the NASA - Mars Curiosity Rover and Laboratory on April, 15, 2015, and identified, on the NASA - Planetary Photojournal, by the ID n. PIA-19400) has been additionally processed, magnified in order to help the visibility of the Landscape's details, Gamma corrected and then re-colorized in Absolute Natural Colors (such as the colors that a normal - in the average - human eye would actually perceive if someone were on the Surface of Mars, near the NASA - Mars Curiosity Rover and Laboratory, and then looked ahead, towards the Horizon and Sky above Gale Crater), by using an original technique created - and, in time, dramatically improved - by the Lunar Explorer Italia Team.